Here is how to enable Do Not Disturb at Bedtime on iPhone, using the “Do Not Disturb” feature as available in iOS and also using the Clock App on your iPhone. When you enable Do Not Disturb at Bedtime on iPhone, all notifications will be silenced and also prevented from flashing on the screen of your iPhone. All incoming notifications during Do Not Disturb at Bedtime will be sent directly to the notifications history on your iPhone. This way the notifications won’t be flashing on the Lock Screen of your iPhone and you won’t be tempted to check notifications during your specified bedtime hours. 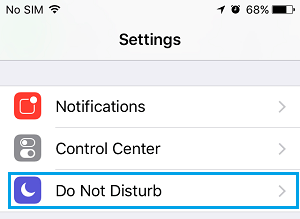 Do Not Disturb Mode (DND) on iPhone only mutes incoming notifications during a set period of time, but the notifications are still visible and can be seen flashing on the Lock Screen of your iPhone. In case of Do Not Disturb (DND) at Bedtime, notifications are both silenced and also prevented from appearing on the Lock screen of your iPhone, cutting down the temptation to check notifications. In case there is a need to check notifications during bedtime hours, you can unlock your device and open the Notification Center. For a good night’s sleep, it is better not to get into the habit of bypassing Do Not Disturb at Bedtime by unlocking your iPhone. Follow the steps below to enable Do Not Disturb at Bedtime on your iPhone. 1. Open Settings and tap on Do Not Disturb option. 2. On the next screen, toggle ON the options for Enable Do Not Disturb, Scheduled, Bedtime and then tap on From/To times. 3. On the next screen, set the From and To times for the Do Not Disturb at Bedtime period on your iPhone. Ideally, the “From” time would be the time that you normally go to bed and the “To” time should preferably be 5 minutes earlier than the time that you want to be out of your bed. 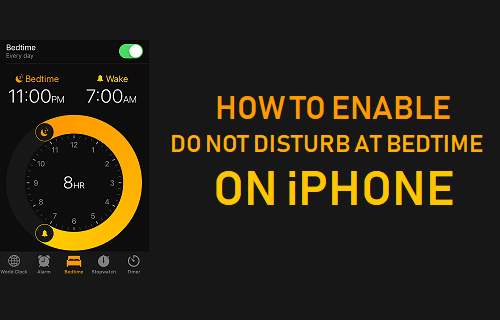 Once you set Do Not Disturb at Bedtime on iPhone, you will find your device automatically going into Do Not Disturb mode on a daily basis during your specified bed time period. Do Not Disturb at Bedtime can also be enabled using the Clock App on your iPhone. 1. Open the Clock App on your iPhone. 3. On the Bedtime screen, setup your Bedtime and Wake time by dragging the Bell and Crescent icons and tap on Options. Note: In case, you are using the clock App for the first time, follow the onscreen prompts to setup your Bedtime and Wake timings. 4. On Option screen, toggle On the option for Do Not Disturb During Bedtime. This will enable Do Not Disturb at Bedtime on your iPhone during your specified bedtime hours.